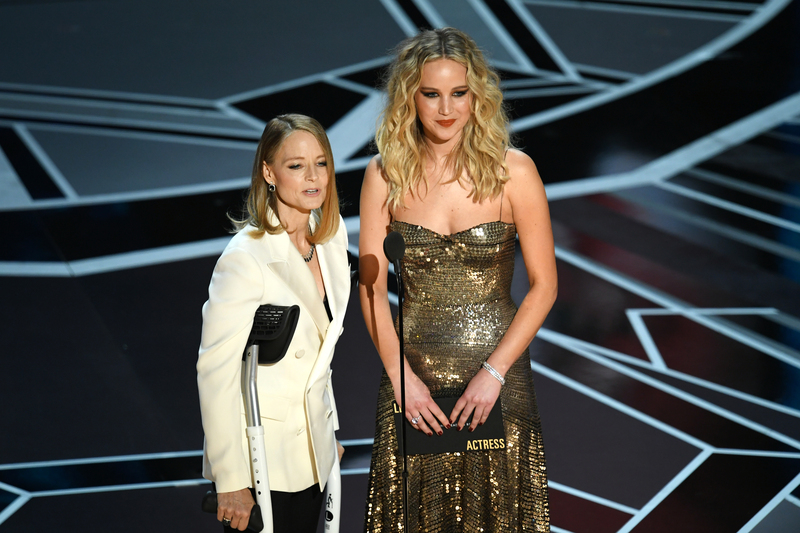 Breaking a long-standing Oscar tradition, instead of having last year’s Best Actor winner present the trophy to the new Best Actress, Jennifer Lawrence and Jodie Foster did it. And this is because, deep breath, last year Casey Affleck won even though he faced allegations of misconduct on set of one of his films, and in this age of Time’s Up and #MeToo he bowed out of attending the ceremony this year — and it was for the best. So that brings us to Jennifer Lawrence and Jodie Foster together on the Oscars stage. The two have worked together before (Foster actually gave Lawrence one of her first roles in The Beaver), and came out joking about Meryl Streep, as you do — but that’s mostly because Foster stepped out with crutches and blamed her misfortune on being “Tonya Harding’d” by Streep. Anyway, they did their little banter back and forth, and all of us watching at home couldn’t help but wonder, “Uh, since when did Jennifer Lawrence grow about three feet?” She completely towered over Foster in a comical way. Like…is this height difference real or not real? Jennifer Lawrence is 11 feet tall. Wait a damn second. Is Jennifer Lawrence huge or is Jodie Foster tiny? Is it a camera trick? Are they Gandalfing Jennifer Lawrence?! The difference is probably, 100% due to the fact that Lawrence is wearing heels, and due to crutches, Foster is not wearing any heels. Thus, a major height difference. But the jokes are  either way.